In the original TTC Capital Budget report, Appendix A, which summarizes the 10-year spending by department and major project group, was based on an earlier version of the budget than was actually presented. It showed a 10-year total that was roughly $500-million lower than the total actually presented to and voted on by the TTC Board. A revised version of this appendix has now been issued. The body of this article has been updated to include this version with the other previously published material. In the discussion of capital budget shortfalls, the magnitude of the gap between available funding and planned projects may be misinterpreted because a few megaprojects dominate the “funded” portion of the budget. A major problem for anyone who attempts to understand the budget is that projects that are really ongoing maintenance with an annual component are mixed together with projects that are one time events. Moreover, projects that are related (new subway cars, carhouse expansion, and other changes for increased capacity) are reported separately under different budget lines. There are also, as discussed in the main article, several projects that are not even in the $9.0-billion version of the budget even though they may affect other projects that are included in the budget. There is a $2.7b shortfall in funding for the decade leaving the net, funded, budget at $6.3-billion with many of the items listed above with either partial funding, or no funding at all. Although a 30% shortfall is bad enough, the percentage is even higher when some of the major, fully funded projects such as the Spadina extension are not included, and the problem is worst in the “out years” of the budget. The TTC faces a severe crisis not just because many of the standing funding programs from Ottawa and Queen’s Park are winding down, but because so much debate and Council attention has focussed on a handful of megaprojects. All the effort goes into finding money for a Scarborough Subway, for example, while other projects go begging and have no advocates or prospects as fodder for election campaigns. The original article from January 9, 2014 follows below. The TTC’s Capital Budget can be challenging to understand not just because of its size (the line item project descriptions fill two large telephone-book sized binders), but because capital projects take many forms. Everyone thinks of the big ticket items such as the Spadina Subway extension to Vaughan because it is quite visible (at least to those affected by construction activities). Many have dreamed of riding a subway to the northwest within their lifetimes. At $2.6-billion, it’s not a cheap project either, but it accounts for only a few pages within those two volumes of the budget. This breakdown was introduced many years ago so that priority could be given to repair work. However, as things have evolved, this distinction is almost meaningless because the vast majority of projects – 92% – are classified as “State of Good Repair”. Adding to the confusion, with the entry of Metrolinx into the local transit realm, there are projects with 100% provincial funding in the expansion category at the same time as several other funding streams for SOGR capital have dried up. (See Exhibit 1 on pp 3-4 of the TTC report.) These are not included in the chart above because they are no longer part of the TTC’s capital budget. Leslie Barns and associated works is treated as SOGR because it supports the replacement streetcar fleet. The introduction of that fleet includes a wide range of projects associated with system upgrades to track, power distribution and carhouse facilities, but this is a one-time, generational change. Work such as the long overdue shift from trolley poles to pantographs, or maintenance facility changes to handle roof-mounted equipment will not be repeated. Routine track and overhead maintenance, on the other hand, will be a steady-state annual project once the backlog of repairs and changes is out of the way later this decade. On the subway fleet, the TR fleet that will eventually take over operation of the YUS line is listed as SOGR, but so are 10 additional trainsets to support ridership growth and a move to automatic train control and shorter headways, something that clearly should be classed as an improvement (by analogy to a planned bus fleet expansion that is only a few lines away in the budget). Similarly, the proposed 60 additional streetcars (beyond an initial 204) are listed as SOGR, not as an improvement. In some cases, improvement-driven fleet expansion triggers other work such as provision of carhouse space and maintenance capacity, and this is not SOGR. One project that has disappeared from the capital list is the proposal to install platform doors at all subway stations. This billion-dollar project (about $15m/station) was classified as SOGR although quite clearly it lies in the realm of improvements. It is part of the “below below the line” group. These are discussed later in the article. It could be argued that responding to growth is part of the TTC’s basic job, but mis-classification of projects risks confusion of the truly necessary, “day-to-day” capital requirements with those needed to support growth and expansion. Appendix A gives a 10-year summary of projected spending organized by department and major project area. This is a rollup of Appendix B (the project detail) which I have omitted here. 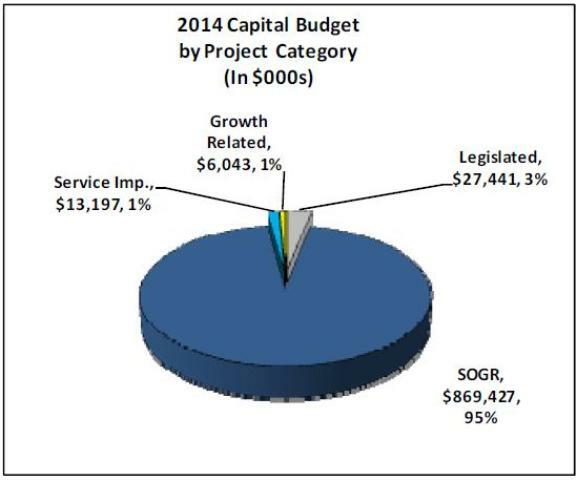 Appendix C states the budget numbers in terms of source of funding. Appendix D shows the proposed cuts to the budget to bring it in line with city debt-based funding targets. This may appear to be something that only the detail-oriented budget nerds would follow, but there is a larger context. Discussions of TTC funding in years past went roughly like this. Our 10-year program is too big for available funding, but the pressures come mainly from large-scale expansion projects and the financial crunch is in the “out” years. For the short term, all is well. That is exactly the position taken in 2013, and also in the initial version of the TTC’s 2014-23 budget (See Appendix C – Sources of Funding). The budget shows a “surplus” of available funding over planned spending in both years. However, the 2014 “surplus” presumes a considerable increase in City funding from $60m in 2013 to $252m in 2014, money taken from “reserves” and “asset monetization”. In other words, the presumption is that the City has assets to sell that can be used to fund TTC requirements. This continues for many years to a total of about $1-billion. That is a lot of assets, and a big presumption that the City would choose to spend the proceeds on TTC capital projects. Moreover, to the extent that this would fund ongoing capital work rather than one-time projects, this is not a “sustainable” mechanism to fund the budget. You can sell the furniture to pay the roofers, but eventually you have an empty house. In its original version, the Capital Budget reacted to the City’s debt targets by placing a number of projects “below the line”, in effect zeroing out their funding, but leaving them visible as future needs for discussion. However, when the budget reached the City, further reductions were requested that cut into the SOGR lines, in some cases quite deeply. Compare Exhibit 5 in the main TTC budget report (the TTC’s list of affected below-the-line projects) with the cuts proposed in Appendix D of the same report (the version which includes the City Budget Analyst’s recommendations). From the planned 2014 budget of $1.171b, the City proposes to strip $77.6m leaving a balance of $1.094. The size and scope of the cuts grow in future years. Below are the details for 2014. Note 1: The garage requirement for McNicoll is affected by the planned fleet size including the proposed service improvement buses in 2019. As these have been cut, part of the garage project is also dropped in the out years. Note 2: TTC had proposed moving to a 15-year bus life cycle which would have eliminated the need for a second mid-life overhaul. However, this would have triggered a greater need for bus purchases as vehicles would be eligible for replacement sooner. The City Budget Analyst did not agree with this approach and recommended that the TTC revert to planning based on an 18-year cycle. The effect for 2014 is to reintroduce rebuilds that would not have been required for the 15-year cycle. Changing the presumed lifespan of a bus is a major policy decision, but this floated through the TTC Board without comment. Note 3: Although there is a small increase in 2014 related to work already in progress, years 2015 onward see considerable cutbacks as this work has been moved “below the line”. The City takes the position that the TTC historically underspends on its capital requests, and that it is not necessary to plan for funding 100% of their budget as submitted. This is referred to as the “ability to spend”. In many cases, the question is one of timing driven by external events such as delays to track projects. The need does not vanish, it simply shifts to future years through deferral. This gives the City a fig leaf behind which it can make a generic budget cut, but does not address the much more fundamental questions of how the TTC’s Capital needs will be funded in the medium and long term. Moreover, the specific budget lines that have been cut are not necessarily those where an “ability to spend” is at issue. The City’s Analyst Notes include a chart (page 19) of the SOGR backlog which would grow from zero in 2013 to $338m by 2023. This is an example of the problem caused by listing almost every project as SOGR. We do not know the degree to which projects that are really for system improvement (relating to growth) are elbowing aside projects related to ongoing basic maintenance. The chart shows a large bulge in SOGR spending in the next few years related to major fleet replacement projects. In the short term, the hit appears to be concentrated on the surface bus and streetcar systems, but in the out years of the budget, cuts appear in subway maintenance project lines as well. The details and effects of these cuts are not discussed in the TTC’s budget report. This situation has very serious implications. Just as happened in the 1990s, the TTC faces a crisis in funding, but management assures everyone that we can “get by”. The details of what we must fund are muddled by a lack of understanding of work that is necessary just to keep the existing system running, work needed to respond to growth, and work needed to improve the quality of the transit system. Meanwhile, Council imposes a cap on City debt on the premise that the tax base cannot handle a greater load, but the same Council is prepared to fund a new subway project with a special tax increase. In past years, Councillors and members of the TTC Board have been told that, yes, there is a funding problem, but it is in the future and it relates primarily to system expansion. From the look of the TTC Capital Budget this year, that statement is no longer true, and Council must face the need for additional funding. If the budget backlog were not bad enough, there is a further list of projects that are not even included in the budget (from page 39). These are the items I call “below below the line”. Some of these may, in the end, be funded substantially or entirely by other governments, but there are no guarantees. It is entirely possible that something like the Yonge Subway extension could find its way back “above the line” and compete with other projects for limited available funding. By analogy to the Spadina Subway project, Toronto might be on the hook for one third of the cost of getting the line to Steeles Avenue or for capacity-related work elsewhere on the existing network. […] there is an urgent need to identify long-term, sustainable and predictable funding sources for the TTC capital plan. This would allow the TTC to proceed with appropriate and timely capital investments in a planned fashion in order to meet the needs of the City and its customers to ensure that the transit system, infrastructure, vehicles and equipment are maintained in a state-of-good-repair and allow for additional required expansion projects, such as the Downtown Relief Line. It is recommended that staff create a special task force, comprised of the TTC Chair, the TTC CEO, the TTC CFAO, the City Manager and the City CFO, to prioritize, seek and secure funding for the $2.5 billion of unfunded TTC Capital Projects. At the very least, this requires a much more detailed understanding of project needs than simply lumping everything under “State of Good Repair”. Moreover, it requires an acknowledgement by Toronto that burning through funding sources to address vanity projects like the Scarborough Subway takes money from the pot that might fund basic maintenance. Although the details have not been formally announced, estimates of the next stage of the federal economic stimulus package put Toronto’s share at around $1b. Over half of this ($660m) is now earmarked, presuming formal agreements, to the Scarborough subway. How exactly this is supposed to “stimulate” the economy in the short term is anyone’s guess, but when there are votes to be paid for, the rules for funding allocation can be flexible. In any event, that money will not be available for other Toronto capital/stimulus priorities. Queen’s Park may send new money Toronto’s way through the transit “Revenue Tools”, whatever they may be, that could show up in the 2014 budget. That has to be passed, not a likely prospect given statements from the opposition parties, and we would then be into an election. Best case for transit? The Liberals get in again and reintroduce the revenue tools. Don’t expect any money until 2015 at the earliest and then Toronto’s share is at best a few hundred million annually. Not peanuts, but it won’t pay down all of the TTC’s capital shortfall. At some point, Toronto is going to have to recognize the need to spend more of its own money on the TTC, and on routine capital projects, not on big ticket, ribbon cutting extravaganzas that do nothing to help with current problems of system reliability and service quality. The TTC must do a much better job of subdividing its capital needs to identify the basics – just keeping the lights on by renewing existing infrastructure – and clearly showing the pressure from requirements for growth and better service so that these can be explicitly funded. “Lumpy” funding requirements caused by timing effects such as large-scale fleet replacements or generational replacement of long-lived infrastructure must be split out so their effect on year-to-year funding can be understood. Projects cannot languish so far “below the line” that they are not even shown in the budget. When these projects do gain political support, they can threaten the stability, such as it is, of the entire package. Toronto needs a great deal more honesty and openness about its transit funding needs. We cannot hope to understand and plan to deal with our requirements if we simply plead poor and hide costs from view. Priorities cannot emerge out of thin air, but should be derived from a full understanding of the effects and tradeoffs involved in choosing what we will build, and what we will choose to ignore. The Ford/Stintz era at the TTC is coming to an end. We have lost three years pandering to a subways-subways-subways mentality that diverted all transit debates into technology wars about a handful of lines while the basics – having enough vehicles to serve routes and providing reliable attractive service – got no political attention. Too much “improvement” at the TTC focussed on the superficial – are the trains and stations clean – and on living within artificial budget constraints from a skinflint Council. The hard work, the advocacy for real improvements in day-to-day transit quality, has been left for a new Commission, a new Council. Once we know what we need for the real SOGR of our current ‘adequate’ system we need to see how much we must spend to accommodate additional riders on the same routes (i.e continuing to meet the same service standards) and then how much we need to serve new riders with new routes like Yonge north or subways into Scarborough. As a taxpayer (to use the Rob Ford word) I obviously like low taxes (or, at least taxes that are not wasted) but I think my taxes are actually too low to provide proper services and are generally quite well spent. Property taxes in Toronto are considerably lower than those elsewhere. As the fare-box can really not pay a much higher share of TTC expenditure and the Provincial and Federal governments show no sign of paying more then the funds needed must come from the City. Though it is clearly a non-starter I would actually reinstate the vehicle tax but devote it 100% to transit and explain to ‘taxpayers’ that this is being charged because the higher levels of government are simply not doing enough. Every transit system has high maintenance costs, even light rail. Los Angeles is spending over a billion dollars refurbishing the Blue Line light rail line, and this is a surface light rail line that is only 20 years old. This seems high to me for a surface light rail line, although this line does go a very long distance. As for the Eglinton LRT, we will have extremely high maintenance costs because so much of the line is underground. At over $5 billion dollars this is the most expensive light rail line being built in the world right now. The tunneled sections cost a bit more than surface light rail due to larger tunnel diameter, the surface sections are cheaper to build of course but limit the line’s capacity. It makes no sense to me not making the outer sections elevated, which increases construction and operating costs somewhat but dramatically increases capacity. The Eglinton LRT is far more expensive to build and maintain than a simple above ground line like Hurontario or Finch West but cannot carry any more people, so I do not think that underground light rail makes any sense if the tunnel is long because the capacity per dollar spent is much worse than subways or surface light rail. You often criticize subways for their very high maintenance costs but ignore that underground light rail also has very high maintenance costs and even surface light rail has substantial maintenance costs. Steve: Of course, as originally proposed, the Eglinton-Crosstown line ran from the Airport to Malvern, and most of it was on the surface. There is no way to get a surface operation (or an elevated for that matter) through the old narrow stretch of Eglinton. That’s a bullet we had to bite. A billion dollars on a 20-year old line doesn’t sound right, and I can’t help thinking there is more going on there than some new track. If you are trying to lumber Toronto lines with those LA costs pro rata, you are guilty of the same sort of selective stats usage that we see so commonly in transit arguments. The Blue Line is 35.4km long, and so $1b represents $28m/km, vastly more than the TTC spends today on track repairs where they must also deal with pavement excavation and replacement, not open right-of-way. According to the LA Times, there is a $1.7b backlog of maintenance on the system as a whole, and there is an $850m project to purchase Blue Line new cars and refurbish others. As for high subway costs, my argument is that once you go with subway, you are committed to that mode and scale of construction even where it is not required. All of the extra cost comes along for the ride. You are distorting my position and misrepresenting the cost and nature of work elsewhere to suit your argument. Better luck next time. What is the issue with 15-year bus life cycle versus 18-years after a rebuild? Is the 18 year life cheaper in capital cost but more prone to maintenance problems? Steve: The issue is that a 15-year bus requires only one rebuild, but an 18-year bus needs two. Depending on how robust the vehicle was in the first place, that second rebuild can be expensive for a limited additional lifespan. This whole debate depends a lot on the varying quality of buses over past decades, and the fact that the USA (who set the standards) moved toward shorter planned bus lifespans. This affected vehicle quality. Speaking of state of good repair is everything alright with your site? Its been inactive for the past couple days. I’m starting to wonder if you’re alive and well. Steve: I was in New York City soaking up theatre and food, with occasional rides on the MTA and a lot of walking. Took a train to Newark airport, one that had a funny thing on the roof and wires over the tracks. It will never work here of course. Penn Station to Newark Airport, one way, adult fare US$12.50 (cheaper in bulk) for a trip that takes up to 25 minutes depending on time of day. Meanwhile we think that a $25 train that isn’t part of the local transit system is a good idea. Cutting route 50 and letting MiWay do pickups in Toronto has been recommended to save the TTC some money (off the top of my head, $4m a year?) while also improving service on the route. Is this still a plan? Steve: Nothing has come forward at Board meetings about this. The estimated cost of operating 50 Burnhamthorpe for a weekday in 2012 was $7,100. Converting to annual costs by a factor of 300 (counting weekends as equivalent to one weekday) gives us $2.13m. This presumes that the Miway service has sufficient capacity to handle all of the TTC demand, an extra 3,100 riders per day. “Bus hoists $65 M” ? That is a lot of jacks! Steve: Many are replacements due to age, some are additions for the artic buses. Aside from the dirtiness of the system, did you notice that the platform height doesn’t match the floor height of the trains? I’m guessing that a wheelchair would have to hop a good 2″ to get onto a train, if a wheelchair can even enter the station that is. And the announcements aren’t reliably audible either. The TTC subway system is actually superior to New York’s subway in many ways. I guess the New York Subway’s sheer size is also its weakness as well. (I’m sure not all of the New York Subway stations are inaccessible though). Steve: Actually, the system is a lot cleaner than it once was, and the announcements in the stations and trains were generally quite audible. Yes there is a gap that is not wheelchair friendly, and it varies by station. It is particularly bad at some rail stations because of the space that must be left for high speed trains to pass. There are many narrow stairways, some a lot dingier and unappetizing than others. Escalators and elevators are nowhere as common as in Toronto. If someone wants accessible service, they would use the surface bus network which is quite extensive even though there are subways. “Accommodation” seems to mean providing a service, not making the entire system accessible. The system is over a century old in places and it shows. I can tell you of another subway system where platform heights don’t match car floor heights and that’s in London. I’ve never understood how something like this could ever have been allowed in the first place, even though handicapped accessibility is a relatively recent issue. And I emphasize relatively as in the past 20-26 years or so. David: I happen to know a little about the history of platform heights. Trains started out being boarded trackside from loose gravel. This seemed to make sense to the stagecoach riders of the time. This quickly got annoying, and paved platforms were built, *very* low, but high enough that you could climb into the train like going up a “normal” staircase. This is still what you’ll find in a lot of the world including most of the western US. On the “subsurface” London Underground in particular, the platform height was standardized assuming one set of rolling stock, and then technical problems caused them to change rolling stock to a different set with bigger wheels and so a higher interior, meaning that there was a step up. This all happened back in the 19th century. I don’t know why NYC Subway has cars and platforms at slightly mismatching levels, but I assume it’s some similar historical accident. The commuter railroads in NYC (Amtrak, NJT, LIRR, Metro-North) mostly have platforms at the same level as the train interior, with the exceptions being old “low-level” platforms . “Gaps” between platform and train are a harder problem than steps. Many of them are due to the historical tendency to build stations on curves, which we try not to do these days. It’s worth noting that wheelchairs have enormous wheels partly to deal with small gaps, and the sort of gap which is typical at a completely straight platform is not usually an issue. Large gaps are a harder problem and usually arise from curved platforms. Most reconstructions relocate stations off curved platforms. Steve: the MTA in NYC has been repeatedly sued for its violations of the Americans with Disabilities Act. It’s the worst transit system in the English-speaking world when it comes to wheelchair access. And this is on a system where almost all the platforms are straight, Union Square excepted. London has much worse physical problems, but they’re *trying* to fix the problems, and the willingness of staff and even strangers to provide assistance make up for the physical problems. By contrast, NYC is just *hostile* to the disabled. NYC’s attitude towards “accommodation” has been ruled to be illegal discrimination more than once, but they keep on doing it. Steve: I am not surprised at the problems in NYC given the age and state of the system. An analogy to Toronto, though, would be the matter of one level of government saying “you must be accessible” but providing no funding with which systems could actually do this (or, worse, stealing funding from other necessary maintenance projects). Something that was quite striking on New Jersey Transit’s trains was that there is a wide gap between platforms and trains even though loading is more or less “level”. The reason for this is that the corridor is shared with express trains that fly through at high speed and need enough clearance that they won’t bounce around and strike the platform. At Penn Station where trains are all running at low speed, platforms I used were built out to fill most of the gap with timbers. Just got back from London/Paris and definitely noticed their “mind the gap” warnings are actually necessary in a lot of places … one train I saw did have what looked like a movable ramp/step that went up and down automatically (can’t remember if that was London or Paris), but they also had Go Train style manually deployable ramps in a few places as well … definitely would be a challenge getting around there anyways I would imagine it would require taking a number of elevator/maze like routes to get to a specific platform in some of the bigger/deeper stations. A Downtown Relief Line (DRL) through Pape will have the highly undesirable effect of knocking out Broadview, King, and Queen streetcar lines. With the introduction of the new high capacity ARTICULATED buses in the TTC fleet (more can be ordered) and a significant reduction in demand on those streetcar routes (thanks to the DRL), there will unfortunately be too much of a push from drivers to get rid of as many streetcar lines as possible. I am hoping that the streetcars will survive the DRL although the services on at least those 3 lines above will be dramatically reduced as a result of the reduction in demand. Steve: I believe that the whole issue of a DRL’s interaction with the streetcar routes has been overstated. For the Carlton car, there are mid-town destinations such as the University that, for someone already on a 506, can probably be reached faster by staying on the streetcar than by making a double transfer via the DRL and the YUS. Same argument for Queen, although some riders destined for the south end of the business district would find a transfer to the DRL of benefit. If the DRL veers south to serve the proposed development on the old Lever Bros. site, it will not connect with the King car at all. As a general note, it is important to remember that many riders are not going downtown, at least to the part of it the DRL would serve. For those who originate close to the core, every transfer adds a significant extra time to their trip. Similar arguments apply to the streetcar lines west of Yonge although the specifics depend on where a DRL West would have stations. As one example, the 504 King does not fill up at Dundas West and run with this load all the way downtown, it collects riders all along the route, much of which is nowhere near a potential DRL station. Under the ADA in the US, you have to make a part of a station accessible if you’re doing major construction on it — you usually don’t have to if you’re leaving it alone. What NYC gets sued for is when it shuts down 10 stations and completely rebuilds them nearly from scratch and STILL doesn’t make them accessible. It’s done this two or three times now, and it just shows a bad attitude. Toronto (like most cities) has a better attitude and will add handicapped-access features when they are rebuilding something anyway.